Hot hatches. What on earth ever happened to ‘em? Ever since Nissan Pulsar ETs and Co. fell off the radar in the late ‘80s, we’ve been stuck with naturally aspirated shopping trolleys that aren’t a patch on the ol’ turbo hatches. 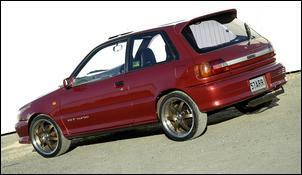 But the Japanese Toyota Starlet GT turbo is a stand-out exception – it’s the only affordable late-model model hatch that delivers turbo-fed grunt. And that’s what attracted Liz Eldridge to this hyper hatch. "I had a Barina as my first car and the Starlet seemed like a quick little car that’s good value - cheaper than something like a Nissan 180SX," says Liz. After handing over AUD$9000 (just over a year ago), Liz became the proud owner of an EP82 ’91 Starlet GT with less than 100,000 kilometres. The previous owner had already fitted an ARE front-mount intercooler with mandrel plumbing, TurboSmart blow-off valve and a 2¼ inch exhaust. 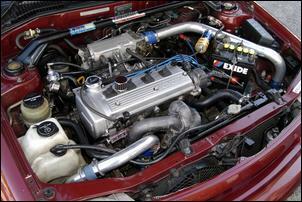 So the 1.3 litre DOHC 4E-FTE engine already made good power. But Liz had bigger plans..."
As a member of www.austarletclub.com she picked up a custom exhaust manifold kit that mounts an ex-WRX TD04 turbocharger onto the Toyota. These late-model WRX turbochargers are available very cheaply (Liz bought hers for AUD$200) and are the perfect size to give the Starlet some top-end grunt with an acceptable trade-off at the bottom-end. The kit comprises a fabricated tubular manifold, high-temp water lines, braided oil lines and a suitable turbine exit flange for the construction of a new dump pipe. 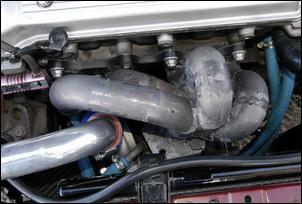 Once the custom manifold and TD04 turbo were installed on her ride, Liz replaced the existing exhaust system with a locally fabricated 2½ inch mandrel job featuring a big 3 inch dump pipe and polished rear muffler. On the inlet side of the turbo you’ll find a K&N pod filter. Fitment of the pod filter also necessitated a rocker cover breather filter (the breather normally vents into the factory induction system). Liz says the breather filter is a temporary measure – an oil catch can is yet to be installed. With boost pressure adjustable though use of a TurboSmart bleed valve, it was soon realised that the Toyota runs an over-boost fuel cut at around 12.5 psi. The solution was to wire in an aftermarket fuel-cut defender. This allows a peak of 15 psi falling back to about 13 psi at the 7000 rpm redline. Aside from the fuel cut defender, the Starlet’s engine management remains untouched. However, the fuel system has been upgraded to cope with the increased induction airflow. 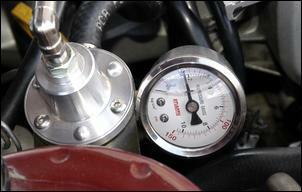 A Nissan S13 fuel pump and Sard rising rate fuel pressure regulator keep the engine running on the rich side. An Exedy clutch has replaced the struggling stocker and an electronic boost controller has also been installed. Liz hasn’t yet ventured onto the dyno with the latest mods but we can tell you the car ran 131kW at the wheels (on a Dyno Dynamics chassis dyno) with the previous boost controller letting boost fall away at high rpm. Liz says the car is now much smoother and faster through the upper rev range and it seems likely that power is up. As part of her hot hatch upgrade, Liz has given her Starlet a set of lowered King springs (which work with the standard dampers) and slotted discs with aftermarket pads. The front strut brace seen in our engine bay photos is a standard Starlet GT item – Toyota obviously recognised the base Starlet chassis needed some beefing to cope with the grunt of the turbocharged 1.3. 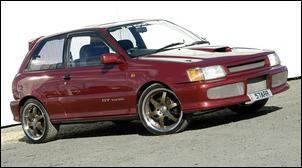 Visually, the Starlet GT is distinguished by its subtle body kit comprising rear spoiler, bonnet scoop (which normally feeds the factory top-mount intercooler), sports bumpers and – get this – an illuminated GT garnish between the taillights. 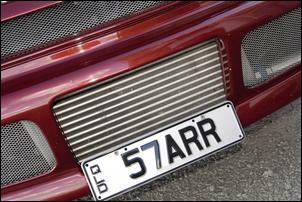 As seen here, Liz’s example has been given the mesh treatment in the grille and bumper openings. The bare aluminium front-mount intercooler blends nicely. Top points are awarded for Liz’s wheel selection. 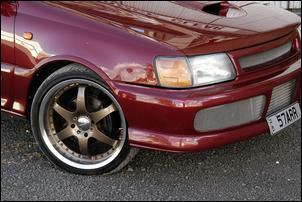 The high-quality Lenso Mean 6 17s match the tone and styling of the car perfectly. Tyres are 205/40 17 Falken FK451s, which improve turn-in response and grip while maintaining a comfortable ride. The words "comfortable" and "hatchback" are rarely used together but the Japanese Starlet GT is a very well kitted little beast. Inside, there are stripy sports seats, power windows and mirrors, climate control and a modern dashboard featuring a digital boost display. Liz’s example is also fitted with an electric sunroof – a feature normally reserved for ‘fat cats’ in their top-line luxo saloons. 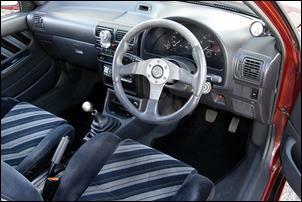 As you can see, Liz has added a Momo steering wheel alongside the aluminium shift knob and A-pillar mounted boost gauge. An Alpine single-DIN head unit is powered by high-quality cables, a gold plated fuse holder and, at present, connects to a pair of 6 x 9s on the rear shelf. With 30,000 trouble-free kilometres behind her and some real performance on tap, Liz has no plans to trade-in just yet. If anything, she’ll look at a fresh coat of factory burgundy paint and perhaps a set of semi-slick tyres for another quarter mile appearance. So far, the car’s best time is a 15.4 seconds – but that was done before the TD04 conversion and the subsequent changes. With the bigger turbo we can only imagine the car will run an easy 14 second pass. And that, ladies and gentlemen, is right up there with some of today’s popular performance cars. 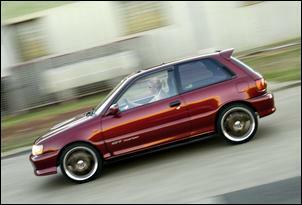 Hot hatches aren’t completely dead yet!